First stop was at the Prince Gong Mansion, a place I haven't visited yet. The mansion was erected in 1777 and still showcases to this day a beautiful set of traditional courtyards and gardens. Today, the mansion is used as a museum and tourist attraction located in Xicheng District, Beijing, just north of the Shichahai Lake. Before purchasing our tickets and making our way in, let's first break bread at a local shack in between the hutongs. The place looked like nothing, which is normally what I look for while searching for authentic local food. Unlike my recent experience in Yangshuo, this restaurant did deliver on its promise with delicious-tasting food that looked exactly like the advertised pictures on the menu. Was that that difficult to achieve?!? After lunch, we headed to the Mansion. Right off the bat, we were greeted by an overcrowded queue of living umbrellas walking extremely close and bumping into each other - like emperor penguins - in the attempt to protect their skins from sun rays. God forbid if a single sunray had to unadvertedly land on their skin! Who know what could happen? Tan, burn, or even worse, vanish! Despite this venue being reputed to be less crowded than the Forbidden City, we still had our share of umbrellas bumping into our throaths on this hot and sweaty day. 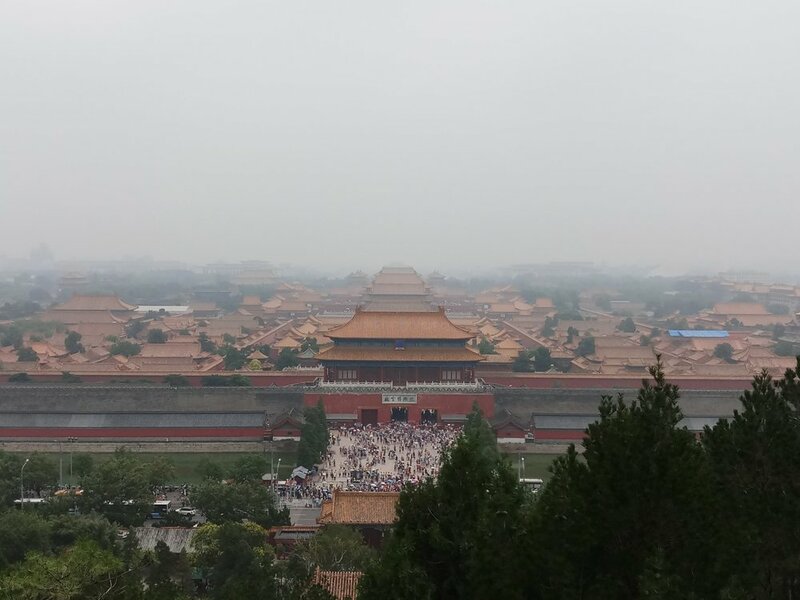 Jinshing Park is the best spot in town to get a semi bird's eye view on the Forbidden City. A fistfull of Yuan will allow you to access the park and walk up the hill to enjoy a mythical panorama - granted, under a thick layer of smog... but still! But first, let us enjoy some hot tea served with nuts and dried fruits right at the tea house right passed the entrance. Exactly one year ago, I stepped on the Great Wall of China for the first time. Back then, I visited the Mutianyu segment with a tour I booked through the hostel where I stayed. This tour was very cheap and a little rushed if you ask me. I did not have quite enough time to fully enjoy wandering around the wall, as I was constantly keeping a time check. Not to mention, I had skipped on the opportunity to come down from the Wall with a tobbogan for lack of time. This year, when Wanwan asked me which segment of the Wall did I want to visit, I immediately said Mutianyu, having in mind that I would definitely slide down the wall with my GoPro on. While booking the private driver, Wanwan asked me if a 9:00am pick up was fine with me. For those who know me personally, I tend to wake up very early while on vacation to ensure I make the most out of my day and avoid the masses of tourists. More time, less stress, better photos… On the other hand, for those who know Wanwan personally definitely know how much of a lazy bum she is. There was no way we could make it to Mutianyu on time to beat the crowd with such a late departure. So I rectified with a 7:00am scheduled departure. A proposition to which Wanwan first objected given her regular lifestyle, but she finally went for it. On the next day in the morning, the driver awaited us in front of the hotel ready to drive us to Mutianyu. At 9:00am, we had our tickets in hand to access the historical landmark, as well as the necessary tickets to go up by chairlift and down by toboggan. We headed to the station to ride up and this is when the clerk yelled in Mandarin that due to the bad weather forecast, the governement issued an order to close the sight at 11:00am. This only gave us two hours to wander around the Great Wall and catch the ride down. Once again, I found myself rushed in time like a bad omen had hit me. We made the most out of our time going up the original stair-master (which Wanwan hated me for it), and took some pretty cool pictures with no one in the background. This is a miracle on its own when it comes to such an important landmark. I guess many tourists decided to cancel their tours because of the announcement to close down at 11:00am. Make lemonade! Having booked the private driver for the whole day, we asked him to bring us to other famous sights around the Great Wall. After three different attempts of finding a landmark that did not also close down due to the same policy, we decided to head back to the city. 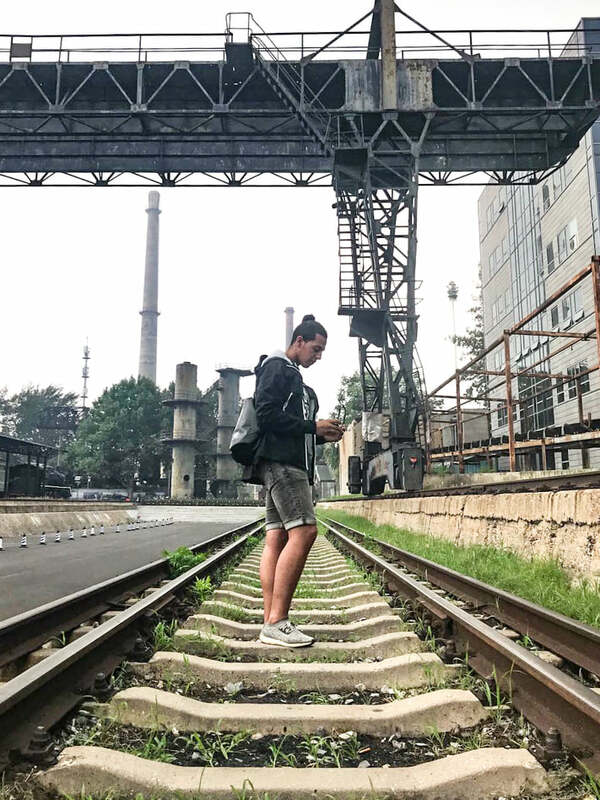 While the rain situation was not nearly as serious as around the Great Wall, we’ve agreed to go wander around an area that was proposed by a fellow traveller I had met last year during my travel to Xi’an, namely the very artsy 798 Art Zone. The so-called 798 Art Zone consists of decommissioned military factory buildings now holding artist studios, exhibits, vendors, street wear shops and eateries. The greater majority of the buildings are boasting a unique architectural style and is a cluster hub for a thriving artistic community. In addition, the whole area’s industrial beauty is tuned up with some of the most beautiful and original frescoes I’ve seen ever since I left Montreal (Canada). There were serious pieces of street art which allowed Wanwan and I to snap some interesting shots. We must have stayed in the district a good three hours until we started to get hungry. To be honest, we didn’t have enough if it. Everything around us was “grammable” as there were definitely some instafamous potential there. The area is a must if you are feeling artsy or if you are looking for a boost to your Instagram account. Besides the frescoes and art galleries, the zone has more to offer, such as countless hipster coffee places, as well as independent street wear shops. We definitely enjoyed that part while looking at some of the fliest pieces of apparel and some very rare kicks signed an adidas x Raf Simons collaboration (#sneakerhead). When it started raining again, we headed back to our accommodation and called it a night. 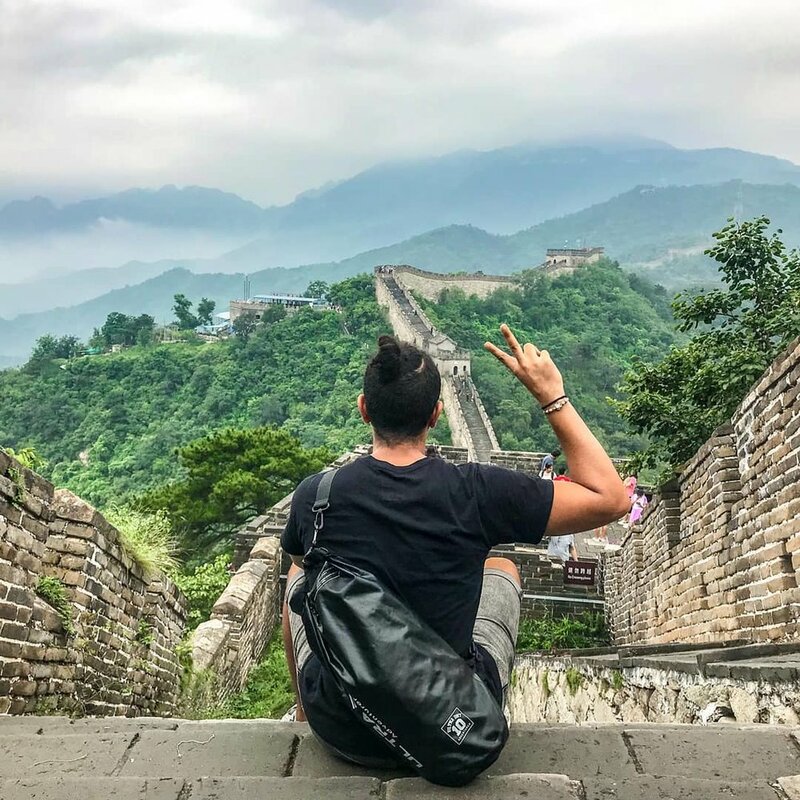 Beijing has more to offer than the known landmarks, such as the Forbidden City or the Great Wall of China. The whole capital is a never-ending nursery of interesting things to do. I personally enjoy walking around the Sichahai Lake at night and visit my favorite street wear shop. Their staff is very far from being warm and welcoming, but it’s a good spot to find some very interesting pieces from different fashion brand consortia. I always end-up going back despite the employees’ condescending attitude. A few laps around the lake and we went to have one last dinner at the famous Quanjude restaurant, known for its Peking Duck. To be honest, neither Wanwan nor myself were impressed with the quality of the duck, not to mention the poor customer service. It’s one of those restaurants that took their reputation for granted and decided to sit on their laurels while the quality of offering declined slowly over time. Well, we tried it and now we know. Therefore, we don’t need to go back to that restaurant ever again. Sichahai is an interesting place to wander around. However, it really turned into a tourist trap with most of the bars charging a cover to enter, or forcing you to buy at least a six beers at a ridiculously high price. Most bars offer some entertainment such as live music. To be honest, with a more attentive listen, you soon realize that those singers are nothing more than amateurs trying to make a living. I guess the music gets better after a few pints. Luckily, very seldom were those experiences in Beijing, as the food scene is very decent and sold at a fair price despite its elaborated tourism industry. We had great fun on that weekend. Luckily, we will have other chances to travel together and explore some of the hidden gems that Asia has to offer.